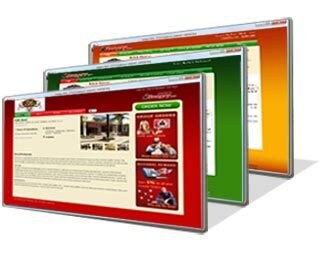 A restaurant website design plays an important role in the restaurant’s marketing mix. It is mainly used as a promotional tool. Now-a-days people hardly get time to go through restaurant guide books and more rely on the online information provided in the home site. Websites not only allow a restaurant to share it’s existence with an extended part of the world (or community), but it allows them to create a unique experience for both their current and potential guests.Our SEO (Search Engine Optimization) specialists can also make sure your business is listed in the directory of local restaurants within the major search engines. Everyone is looking for convenience and online ordering is as convenient as it gets. All a visitor needs to do is find your website, and they can instantly place an order. Offering online ordering can increase sales by getting impulse sales as well. What's better than a pick-up/delivery order? You sell your food for the same price, plus a delivery charge if applicable, and don't have to worry about sitting them, serving them, and cleaning up after them. Plus, many of the bigger chain restaurants offer online ordering with special parking for pick-up. When a customer adds an item to their shopping cart, you can offer them similar items. During the website development process, talk to your developer about this. By associating items that visitor often order together you can make suggestions. Or you can set your website up to offer similar items yourself manually. Especially when you show them similar items and tell them to! It's just like waiting in line at the grocery store. Occasionally you'll see a magazine or a candy bar that you can't resist. After a customer places and order, their information is saved in your database. You can use this information at a later date for email marketing and traditional mail marketing. You can also ask them for opinions and recommendations about your food, service, and website. Providing an automated reservation system that allows guests to make their own reservations. Making reservations for a day can be tough if you don't get to it early. If a visitor was looking for day specials and found your restaurant website, you are already half way there to having them in the restaurant. Your restaurant website is a great place to advertise your day specials. Most restaurants specialize in one type of food, ranking highly in local searches for that term can be quite easy, as long as you have a good website. Having your day specials on your website allows visitors to share your specials with their friends. Your website is 1 of the easiest ways to share information. Mailing list creation for easy newsletter sending and restaurant promotions. Mailing list subscribers are like website visitors, but better. They are people who want to be updated about your specials and events. Allow restaurant to display an endless amount of print material without ever facing the printing costs. Everything from brochures to menus, everything can be provided at the click of a button. Simple user-interface Admin Panel for creation and configuration of menu groups, menu items, etc.